Lygia Clark is considered one of the most important artists to have emerged in Brazil during the 20th century. Her work has now gained such wide ranging international recognition that her position within art history is assured as an artist who has been hugely influential and precursory within contemporary art at large, a feat that during her own lifetime would have seemed inconceivable. Much of her work from the late 1960s onwards was then considered by many art critics to have drifted away from the field of art altogether. However, with the emergence of practices that possess social and relational characteristics, together with several posthumous international exhibitions, Lygia Clark’s radical position has, over the course of the last two decades, rightly come to be vindicated. Lygia Clark began her art education in Rio de Janeiro under the artist and designer Roberto Burle Marx in 1947. She later travelled to Paris in 1950 to further her studies under the tutelage of several artists, amongst them Fernand Léger. The significance of these two early tutors cannot be underestimated. This educational background makes Lygia Clark a rare link between the Modernismo that characterised modern art in Brazil between the 1920s and 1940s, and the post-war emergence of the abstract geometric and the neo-constructivist trends such as art concret that had such profound repercussions within the local scene and beyond. Burle Marx had been the principle landscape designer and collaborator alongside prominent modern architects such as Lúcio Costa and Oscar Niemeyer, who adapted Le Corbusier’s architectural doctrines transforming them into a specifically Brazilian (inter)national style. Fernand Léger, on the other hand, had during the early 1920s been the tutor of one of the founding artists of Brazilian modernism, Tarsila do Amaral. Perhaps the painter most associated with the origin of the notion of Anthropophagy – its manifesto having been written by her then partner Oswald de Andrade – Tarsila do Amaral adopted the notion as the very theme of her paintings of the late 1920s and is sometimes credited with having coined the term itself. The 1928 Manifesto Antropófago (Anthropophagite Manifesto) provocatively equated the Brazilian cultural condition with the cannibalism of some of the native tribes who ritualistically devoured the early European colonizers. Seen from this perspective it was only natural for Oswald de Andrade that the Brazilian modernists should assimilate the European modern aesthetic, making of it one’s own culture and in the same stroke ridding oneself of the guilt associated with cultural derivation. Anthropophagy would later feature as an overt theme within Lygia Clark’s own garments and performances during the 1960s. Her interest was not so much the product of her reminiscence or nostalgia of her formative background, but rather an alignment with the general resurgence of attention to Oswald de Andrade’s concept as a means of mediating national identity and international mass culture whilst concurrently offering an appropriate metaphor for the barbarism of life under a military dictatorship. However, Lygia Clark’s relation to the wider repercussion of this resurgence is more complex and original. Her approach was introspective and subjective, rather than referential to external trends and mass cultural influences, since it was within this context that she proposed a form of therapy which would eventually expand our understanding of art itself. The conjunction of Léger and Le Corbusier also emphasizes the influence that the premises of Purism had within the Brazilian cultural landscape throughout the 20th century, both within the spheres of early modernist painters as well as architects. In the case of Clark’s workfrom the 1950s, we can observe interesting interrelations between constructivist oriented art and modern architecture, in her production of architectural models and spatial exercises with the most modest of objects. Lygia Clark’s first solo exhibition was held while she was still in Paris, at the gallery of the Institut Endoplastique in 1952. According to Roberto Pontual, it attracted the attention of prominent artists such as Jean Arp, Yaacov Adam and Michel Seuphor. Upon her return to Brazil she joined the Grupo Frente, which developed around artist Ivan Serpa. It was at this stage that her work gained a closer relation with the premises of art concret, which at the time was being promoted by artist Waldemar Cordeiro through the Ruptura Group in São Paulo. During the mid-1950s she participated in several international exhibitions of Brazilian art in Paris, Montevideo, and Buenos Aires. In 1959 she signed the Neoconcrete Manifesto, becoming what is often described as the paradigmatic neoconcrete artist. The poet and art critic Ferreira Gullar, spokesman of the group, described the work that Lygia Clark produced immediately before the formation of neoconcretism as follows: "The importance of the series of works produced by Lygia Clark between 1954 and 1958 resides in the fact that through these works she freed the picture from its traditional connotations, breaking away from the space of representation that had been maintained throughout the non-figurative evolution from Mondrian to the concretists." Dating from this period are the Superfícies Moduladas (Modulated Surfaces) which were constructed from black and white wooden panels painted with industrial paint. Lygia Clark would describe the groove which separated each of these panels as the organic line, leading Ferreira Gullar to develop further theoretical elaborations on the subject. 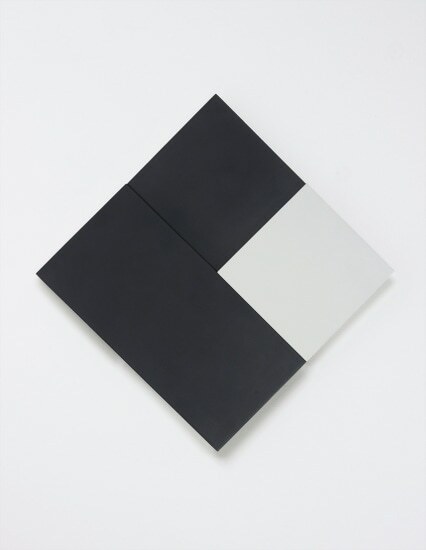 Lygia Clark’s Contra Relevo is a highly significant work of her neoconcrete period. It represents a clear progression into markedly neoconcrete lines of aesthetic enquiry. From her previous Modulated Surfaces, with the idea of the organic line, the Contra Relevo presented a new disposition of planes that no longer aligned within a single plane. It also opened the way for the articulated aluminium planes that appeared subsequently with Lygia Clark’s Bichos series, which involved the spectators even further by inviting them to physically manipulate the object. Perhaps more importantly, the Contra Relevo invites one to speculate on the impact that Lygia Clark had upon the development of neoconcrete theories, particularly through Ferreira Gullar’s writing. It is a well known fact that one of her works was the subject of a now legendary discussion between art critics Mário Pedrosa and Ferreira Gullar. According to Gullar’s own account, this discussion would lead to the elaboration of the Theory of the Non-Object, perhaps the most crucial contribution of Neoconcretism in terms of its repercussions upon subsequent generations of artists. The discussion took place over dinner at Lygia Clark’s home when both critics were asked to express their opinion as to how the artist should name a particular work of art. Pedrosa with some difficulty finally reached the conclusion: the work consisted of a relief, since it possessed a number of planes that did not coincide. Gullar, on the other hand, did not agree with the terminology and having no other way of describing it, called it, jokingly, a non-object. Pedrosa laughed at the proposition, claiming that an object is either an object or something else entirely, arguing that the idea of a non-object did not make sense. According to Gullar, after the joke subsided he could not get rid of the idea, and hebecame so obsessed that, the following day, he set upon the task of elaborating his suggestion into a hypothesis. These notes would eventually lead to the publication of his Theory of the Non-Object in December 1959, in the weekend supplement of the Jornal do Brasil. His text possesses certain proximities to Donald Judd’s subsequent essay Specific Objects, which sought to describe his own work and that of his colleagues. In none of the several accounts of this episode has Gullar specified which precise art object by Lygia Clark led to the debate. However, it would not seem too much of a speculation to suggest that itmight have beenthe Contra Relevo here displayed. The clue lies in its title Contra Relevo—the innovative term suggests a diplomatic solution in which both positions, that of Gullar and that of Pedrosa, are adequately referred to. In this light, the present lot assumes a rare distinction, that of sparking the idealogical discourse which forever changed the future of contemporary art in the Americas. Lygia Clark was a Brazilian artist associated with the Constructivist and Tropicalia movements. During the 1950s she was primarily known for her paintings and sculptures, but during the 1960s and 1970s she began to explore the idea of sensory perception. Along with other Brazilian artists including Helio Oiticica, she co-founded the Neo-Concrete movement based on the principle that art should be subjective and organic, liable to manipulation by the spectator. She sought new ways to engage the viewer ('the participant') with her work, which became increasingly abstract and holistic. Clark's focus on healing and art therapy redefined the relationship between art and the public, and has become a seminal point of reference for contemporary artists addressing the limitations of conventional art forms. Titled "Objeto N. 7" on the reverse. This work is accompanied by a certificate of authenticity issued by the Estate of Lygia Clark, registered under number 491.